Little notes from Heather and Martin: Neighbours Day is coming! We've really enjoyed Neighbours Day over the years. We were spoiled in that a highly energetic former neighbour got the ball rolling in our street around 8 years ago: since then it's just been a matter of keeping it going. However, if nothing's already established where you live, the Neighbours Day website has a bunch of great ideas of how to get started. Maybe you could invite the people in a few houses nearby to a potluck picnic or a simple afternoon tea? 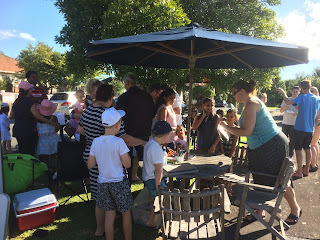 I've made a number of friends in our street through Neighbours Day celebrations and highly recommend it :-) Also, social isolation is such a huge issue in Aotearoa; I've come to really value Neighbours Day as something of an antidote to that.